What Is The Flippening? Is It Game-Over For Bitcoin? Crypto-traders more or less have heard about the term Flippening. What exactly is it? Bitcoin has always had the top market capitalization dominance for the past few years but this is about to change. 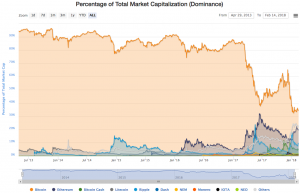 As at the time of my post, BTC only takes up approximately 35% of the entire crypto market cap, down from 95% in 2013. Why is that the case? People in the crypto field has started to diversify their portfolio by investing in different altcoins as there is a growing concern over Bitcoin’s issues with scalability. At one point last year, it took around a few hours to send a bitcoin transaction across the network and on top of that, it cost US$15 per transaction, which isn’t only crazy, but extremely expensive for a transaction cost and unsustainable in the long run. One of the main features of cryptocurrency is that it is fast and low in cost because the entire system avoids intermediaries, however, this is now no longer the case for Bitcoin. Altcoins were initially deemed as a second bitcoin and were not much looked at simply because it was not as popular as Bitcoin. However, if you look closely at what they offer, they can be far more superior than Bitcoin. 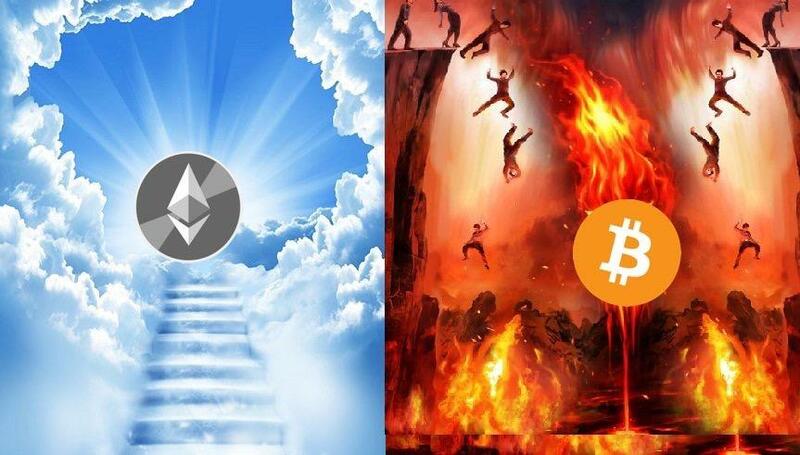 Let us take Litecoin or Ethereum for example. If you tried to send either coins over from 1 wallet to another, it would take you half or a quarter of the time needed to send a Bitcoin across the network. As a result, there is this paradigm shift known as the Flippening. It is highly possible that Bitcoin may lose its place as the most prominent cryptocurrency in the future. Bitcoin’s share of the total cryptocurrency market cap has been dwindling over time and perhaps this year, the Flippening might happen. Leading the Flippening is currently Ethereum. Most of the ICOs out there are offered based on top of the Ethereum blockchain rather than the Bitcoin’s technology. It is evident that Bitcoin cannot compete with most of the newer coins out there in its current state of technology. True, Bitcoin does indeed have a powerful network effect from its first mover advantage. My grandparents might never have heard about Ethereum but definitely, they have heard of Bitcoin. Currently, as of the timing of this writing, Bitcoin is still the number one cryptocurrency that beginners would throw their money into, but would their investments be worth their returns? However, Bitcoin might have a fighting chance once it implements its lightning network during the rollout of Bitcoin 2.0. With that being said, Ethereum is working on their scalability as well with their sharding project. Ethereum went from $7 to approx. $700 in 2017 – 100x returns. Bitcoin went from $800 to $13,500 in 2017 – 17x returns. What are you going to stake your investments in? If you enjoy reading cryptocurrency analysis like this, feel free to join my telegram channel for constant updates! I would like to learn about crypto. Thank you for your interest Phillip! We would be pushing our more content explaining cryptocurrency in the future. Keep in touch!